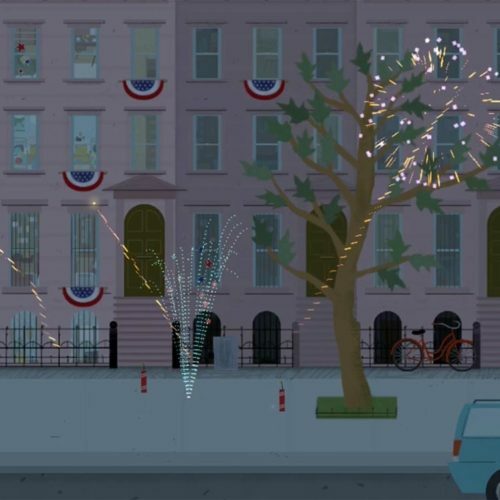 There are lots of reasons for us to be excited about this app: it’s gorgeous—the artwork was created by Tinybop’s own Sarah Jacoby, who is also a production designer. And it’s an adventure—from oceans to glaciers, deserts to mountains, the landscape changes as kids trigger rockslides and earthquakes (and tumble houses into the air! ), crash waves onto beaches, and erupt volcanoes. As they unleash geological forces with their fingertips, kids see how our home is an ever-changing planet. Mountains rise and fall right under our feet. Beaches are swept out to sea to eventually emerge on other coasts. If we’re lucky, we notice these transformations in everyday adventures: if you summit a mountain, you’d see that it’s a pretty unstable pile of rocks, not the solid mass it appears to be at a distance. If you regularly walk along a coastline, you’d see it grow and recede with the seasons. But even given these hints, it’s hard to imagine the changes the Earth undergoes—and how those mountains and beaches came to be in the first place—over eons, an expanse of time and life that greatly exceeds our tiny human existence. They’re pretty wild ideas made a little more accessible when you can hold The Earth in your hands. We hope the app brings your kids both a greater understanding and increased curiosity about the world around us. Get The Earth on the App Store and let us know what you think!